Many more cheap concerts for students from WPAS! 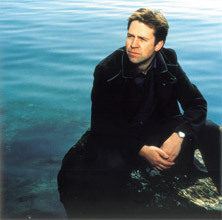 Leif Ove Andsnes, piano has made a name for himself as one of the truly elite pianists of his time. On Sunday evening, he will play a simply gorgeous program of Chopin and Debussy at Strathmore. A rising international star, cellist Sol Gabetta has been winning competitions since age 10 and soloing with orchestras around the world, including the Vienna Philharmonic. She makes her Kennedy Center debut on Saturday afternoon. More performances may be added throughout the year. Announcements of any additions to the student ticket list will be made immediately. Call WPAS Ticket Services at (202) 785-WPAS. You do not need any codes. For complete student ticket policies, please visit http://www.wpas.org/studenttickets.aspx on our website. 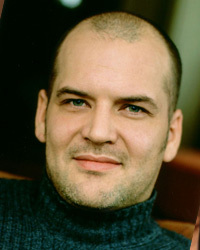 Baritone, Florian Boesch will be presenting a program of Schumann and Schubert lieder Wednesday, February 15th, as the latest concert in Vocal Arts DC‘s 2011-2012 season. He will be accompanied by pianist, Roger Vignoles. Full program available here. Again, there are reduced price ($15) tickets available for all students, and music students can get in free by emailing Robert at robertsheehan@vocalartsdc.org. 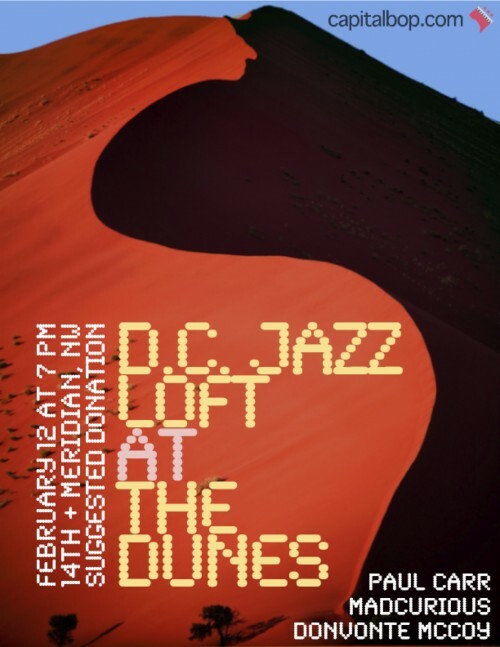 Capital Bop’s DC Jazz Loft has a new home in the Dunes, a gorgeous art space and performance venue in Columbia Heights. This Sunday, DC Jazz Loft will be hosting its first show there, and things are going to start off with a bang: This is arguably the strongest lineup of any D.C. Jazz Loft, ever. It will be featuring performances by hard-swinging saxophone giant Paul Carr, Lenny Robinson’s deep-seeking trio MadCurious (featuring Brian Settles and Tarus Mateen) and trumpet innovator Donvonte McCoy. As always, the loft is a donation-based affair; it is strongly suggested that you drop at least $10 into the musicians’ donation box on your way in the door. And, as usual, the show will end in an open jam – musicians, bring your axes! 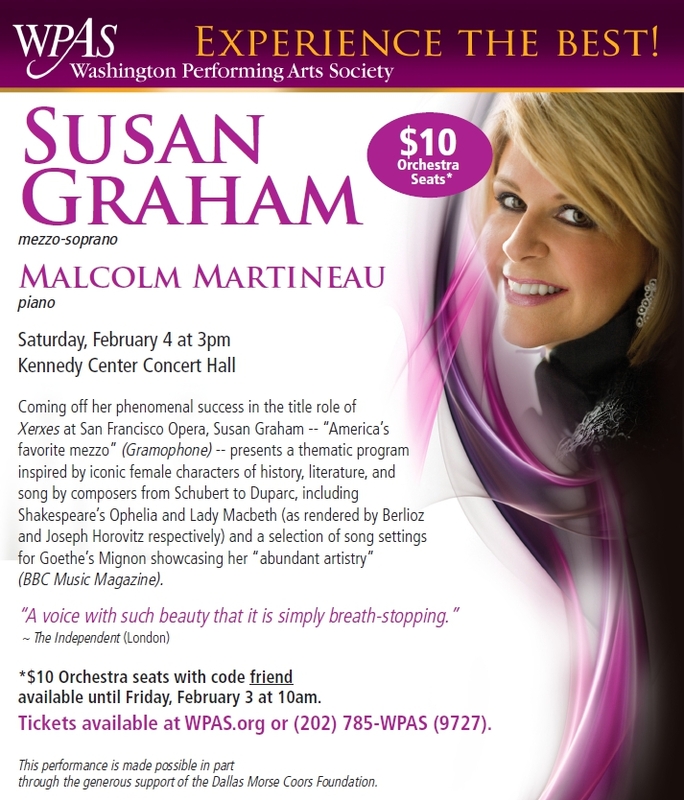 See you all at the Dunes this Sunday at 7 p.m.
Mezzo-soprano Susan Graham will be performing at the Kennedy Center Concert Hall this Saturday, February 4th at 3pm, and WPAS has made tickets available to students for only $10! All you need to do is call the box office (202-785-9727) by 10am Friday, and let them know you’re a student. Coming off her phenomenal success in the title role of Xerxes at San Francisco Opera, Susan Graham — “America’s favorite mezzo” (Gramophone) — presents a thematic program inspired by iconic female characters of history, literature, and song by composers from Schubert to Duparc, including Shakespeare’s Ophelia and Lady Macbeth (as rendered by Berlioz and Joseph Horovitz respectively) and a selection of song settings for Goethe’s Mignon showcasing her “abundant artistry” (BBC Music Magazine). 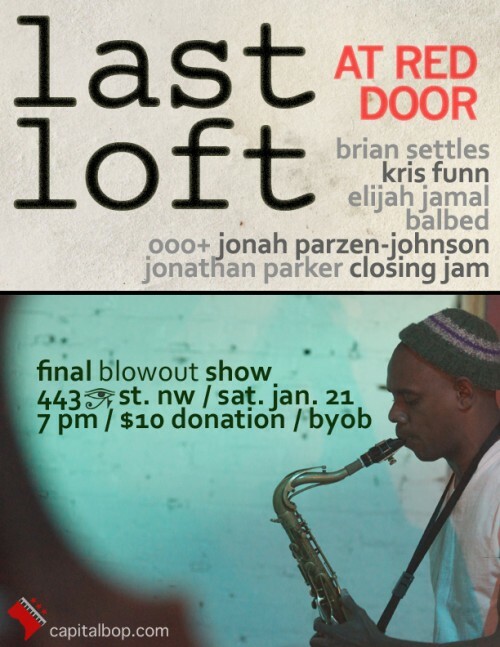 Tomorrow night, Saturday, January 21st, marks the end of the road for the D.C. Jazz Loft series at Red Door (443 I St NW, go down the alley and look for the red door). It begins at 7pm and will go . . . well, presumably pretty late. It features a who’s who of DC’s young jazz scene including Brian Settles, Elijah Jamal Balbed, Jonathan Parker, Kris Funn, and Jonah Parzen-Johnson, as well as the 000 trio, featuring AU Music Library alumnus, Luke Stewart. For more details on the performers, including sound samples, check out the CapitalBop blog post. It’s the first Vocal Arts DC concert of 2012, and – again – it’s a phenomenal deal for students. If you’re a student, you can get a reduced-price ticket ($15) by emailing Robert at robertsheehan@vocalartsdc.org. If you’re a music student, tickets are available for FREE. Can’t beat that! Lydia Teuscher will be performing a program of Haydn, Schubert, Mendelssohn, Schumann, and Strauss along with accompanist, Graham Johnson. Full bios are on the VADC website. 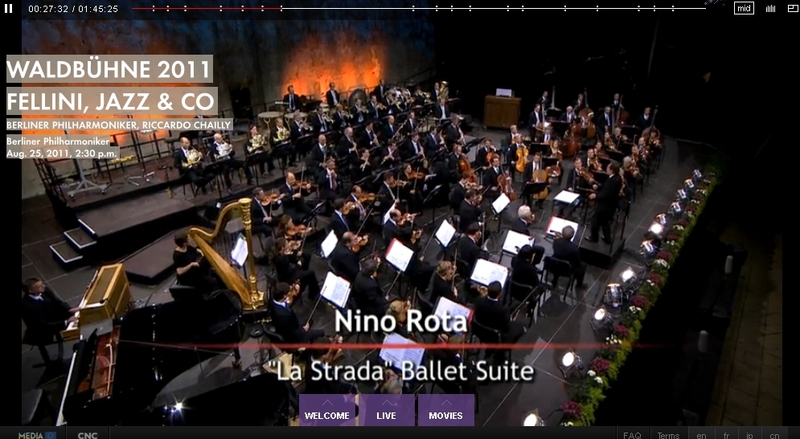 Founded in 2008, has since broadcasted over 200 classical music events, boasts 12 million watched videos, with an average of 80,000 single visitors each month. Video on Demand: medici.tv has over 700 programs available for streaming including filmed concerts, archived movies (from such legends as Maria Callas and Leonard Berstein), documentaries on performers and composers and educational programs and master classes. To access this resource: Go to the American University Library webpage –> select “Search Databases” –> and find medici.tv!! !